i Click 'view all' to instantly compare this ok deal with offers on other top wireless keyboards. 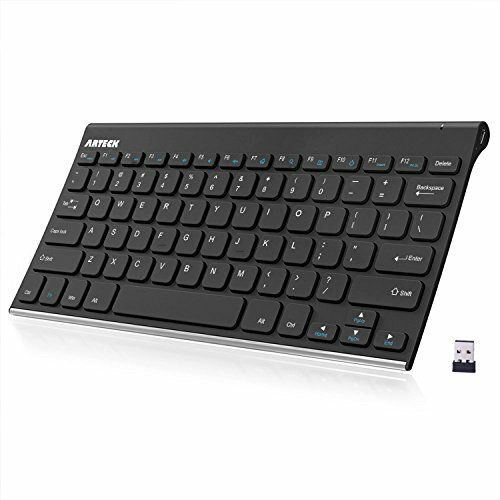 Arteck Wireless Keyboard Ultra Slim Full Keyboard & Rechargeable is currently selling at $22.99, which is its normal price. It has a lowest price of $22.99 and is selling within its usual range. Price volatility is 0.15% (meaning it does not change often), so you might have to wait a while for the price to drop. Until then this is a recommended 'ok deal'. The current deal is also the best price on this item over the last month. 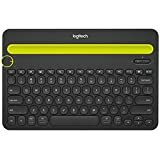 Compare the current price, savings (in dollars & percent) and Buy Ratings for the top Wireless Keyboards that are closely related to Arteck Wireless Keyboard Ultra Slim Full Keyboard & Rechargeable. Here is how Arteck Wireless Keyboard Ultra Slim Full Keyboard & Rechargeable compares with other leading Wireless Keyboards. Industry Leading Ergonomic Design Stainless steel material gives heavy duty feeling and the low-profile keys offer quite and comfortable typing. Easy Setup and UseJust simply insert the nano USB receiver into your computer like desktop or laptop, then the keyboard can be used instantly. No need driver.The Keyboard will work up to 33 feet or 10 meters.It allow you to gain quick access to common functions, such as volume level, playback control, copy paste text, and more. Comfortable, quiet typing The whisper-quiet, low-profile keys bring a whole new level of comfort to your fingertips. What's more, keep all your most-used functions and media controls closer than ever Windows-dedicated hot keys.The construction of this scissors-kick keys can be used more than 3 million times continuously. Rechargeable Battery Built-in industry-high rechargeable Li-polymer battery provides 6-month use on a single charge. (based on 2 hours non-stop use per day) FeaturesEasy Setup: Simply insert the nano USB receiver into your computer and use the keyboard instantly.Ergonomic design: Stainless steel material gives heavy duty feeling, low-profile keys offer quiet and comfortable typing.6-Month Battery Life: Rechargeable lithium battery with an industry-high capacity lasts for 6 months with single charge (based on 2 hours non-stop use per day).Ultra Thin and Light: Compact size (11.1 X 5.3 X 0.16in) and light weight (10.2oz) but provides full size keys for comfortable typing.